This commemoration is a 2018 addition to A Great Cloud of Witnesses. 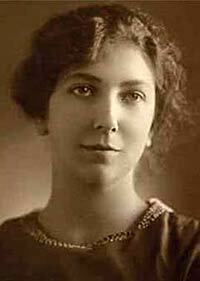 Teresa of Jesus of Los Andes (13 July 1900 – 12 April 1920) - born as Juana Fernández Solar - was a Chilean professed religious from the Discalced Carmelites. She was a pious child but had an often unpredictable temperament, for she could be prone to anger but could also demonstrate her charitable and loving nature; however she seemed transformed when she decided to become a nun. In May 1919 she entered the novitiate of the Discalced Carmelites in Los Andes at which time she was given the new religious name of "Teresa of Jesus". Toward the end of her short life the new nun began an apostolate of letter-writing in which she shared her thoughts on the spiritual life with others. But she soon contracted typhus, although some historians have suggested that she might have contracted Spanish flu, which was devastating Chile at this time. She was allowed to profess her vows "in periculo mortis" ("in danger of death") on 7 April 1920. Fernández Solar died 12 April 1920.